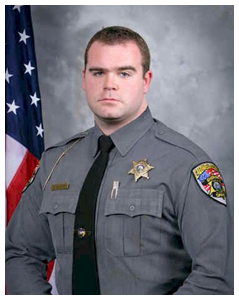 Deputy Adam Klutz was shot and killed while responding to a 911 hangup call on Fox Winkler Road. When Deputy Klutz arrived at the scene a man at the home opened fire on him with an AR-15, striking him in the head as he exited his patrol car. A second deputy who arrived moments later was shot in the chest once before he was able to exit his patrol car. The round that struck him was stopped by his vest. Deputy Klutz was transported to Caldwell Memorial Hospital, where he died from his injuries. Five days after the shooting the suspect’s body was found on his property suffering from a self-inflicted gunshot wound. Deputy Klutz had served with the Caldwell County Sheriff’s Office for 1.5 years and had only been with the Patrol Division for 5 months. He is survived by his parents.